One candidate REFUSES to tell gun owners where he stands on the Second Amendment, an extremely ominous sign to be sure. Another candidate has pledged to vote pro-gun. But the third candidate has pledged to LEAD in the gun rights battle in Cheyenne, by promising to sponsor pro-gun bills. What’s more, this candidate has been a gun rights leader for the last two years, as a member of the Wyoming House! To help you cut through the noise and find out where these candidates stand on your gun rights, we’re produced this video update for you to watch! P.S. 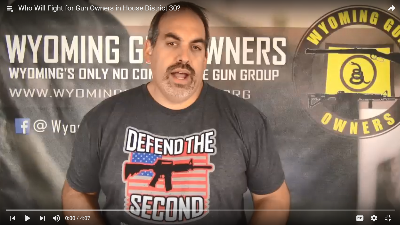 With just days left until the August 21st primary, WYGO has produced a video update so that gun owners in Senate District 21 (Sheridan Co) can find out where the candidates stand on your right to keep and bear arms! If you have any friends in Sheridan County, please share this with them as well. Fred Emerich: Almost Ten Years of Opposing Your Gun Rights!